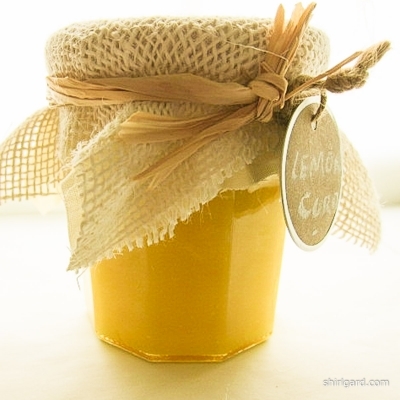 This is a follow-up to my last post: Lemon Curd (3.09.15). Since I made a large batch of Lemon Curd in the process of creating that post, I was motivated to create something new to show an example of one way to use it. 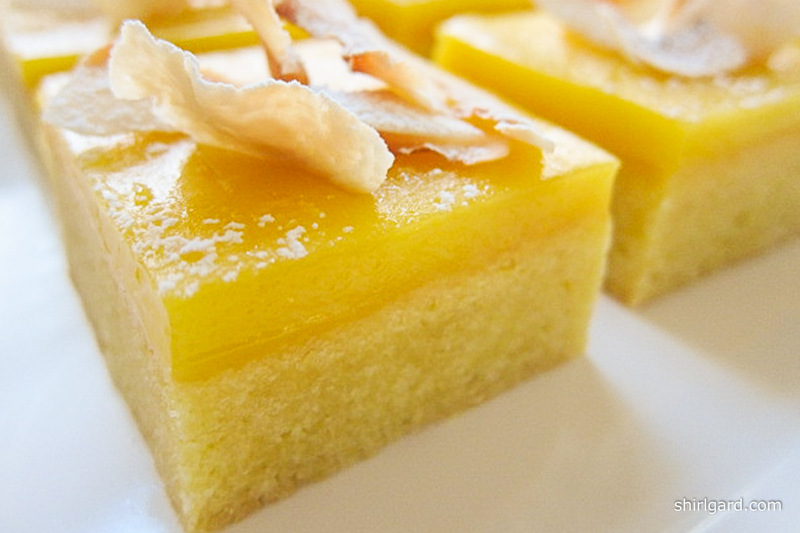 A flash of inspiration produced Lemon Curd & Sablé Breton Bars. For the crust, I turned to Sablé Breton. 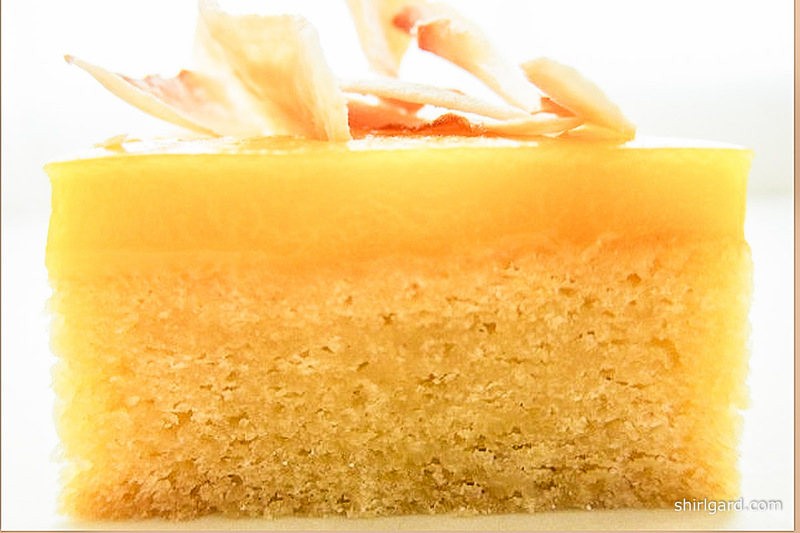 Sablé means, literally, sand in French. Breton is a Celtic language spoken, along with French, in Brittany, which is where this recipe originates. If you put these two things together, you have Sablé Breton, which is a buttery, sandy-textured French version of shortbread cookies, sometimes referred to as Breton Biscuits. In addition to using this dough for cookies, it is a favorite of mine and of many other pastry chefs, to use for dessert bases or tart shells, so it seemed like a perfect choice for the crust of a pan of Lemon Curd Bars. I like it here, not only for the wonderful flavor and texture that it provides, but also because it is so easy to cut neatly into bars. 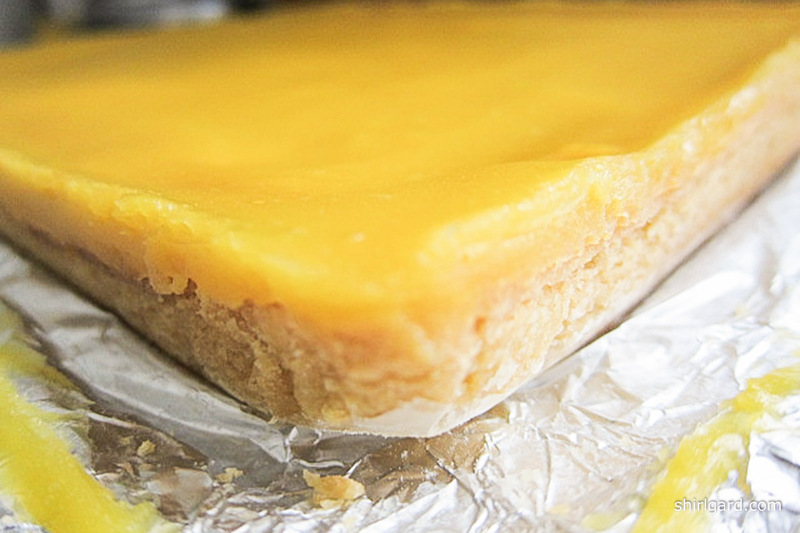 Since Lemon Curd has such an intensely lemon flavor, I chose to make the curd layer half as thick and the crust layer twice as thick as Classic Lemon Bars. 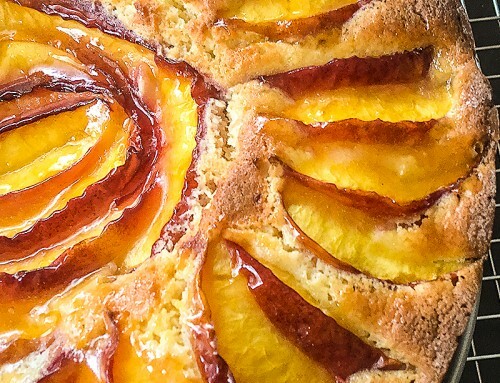 This is so a bite will be a nice balance of crust and filling and won’t overwhelm you with too much tartness. 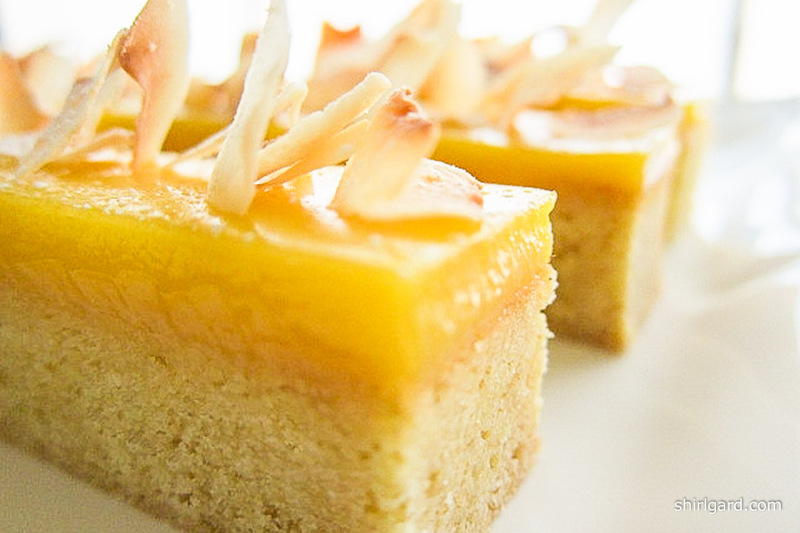 These bars are like a blank canvas, in that you can garnish them in many different ways. 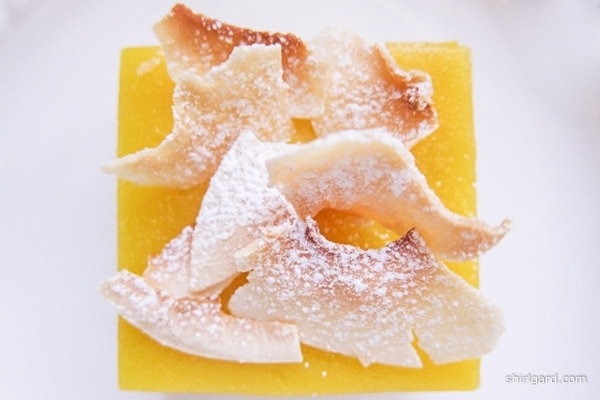 I chose two ways to top them off: toasted coconut flakes (chips) or Italian Meringue “kisses”. If you are short on time, just a dusting of powdered sugar is fine, or leave them plain to show off the bright yellow curd. English Tea—This is the original use— Lemon Curd, along with Clotted Cream, are classic teatime spreads (or condiments), traditionally served with small scones. 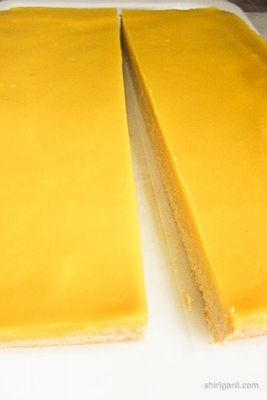 Layer Cakes—Use my post for Lemon Chiffon Mousse Cake as guide for using Lemon Curd in layer cakes. 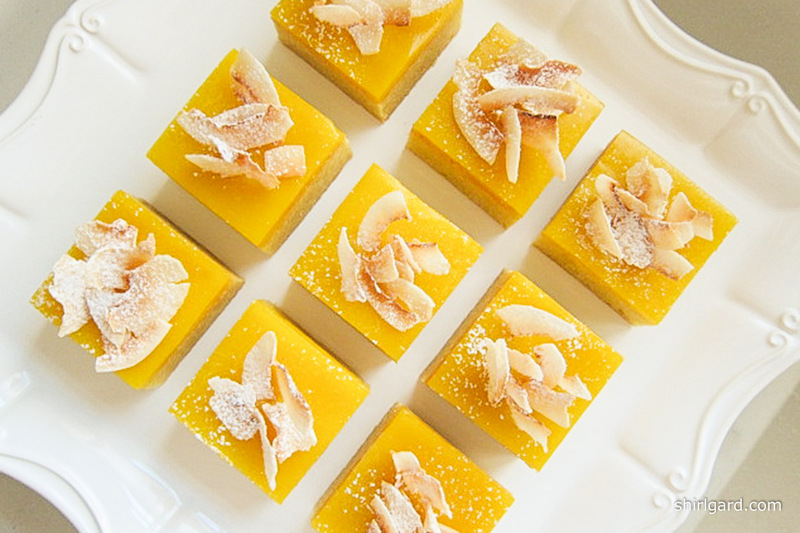 Cake Rolls—A thin spread of Lemon Curd is the perfect filling for a cake roll. 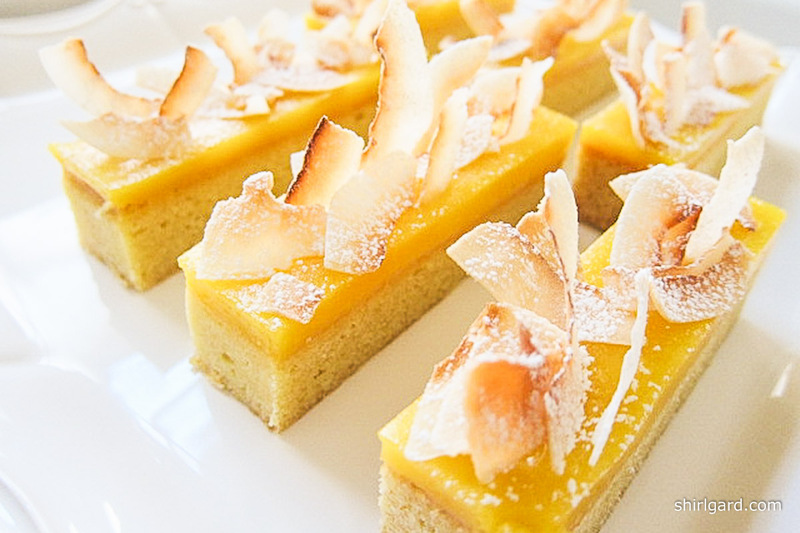 Tartlets—Little tarts are best, to show off the delicious tartness without overwhelming the palate. 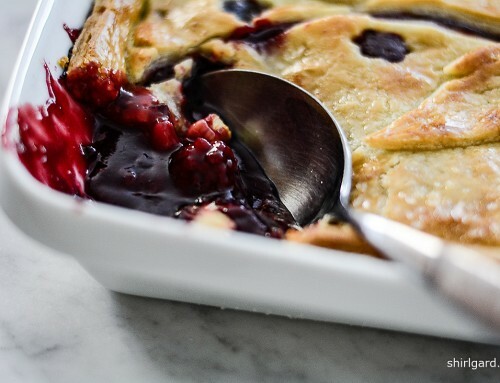 Lemon Curd and fresh berries were made for each other; combine the curd with fresh blueberries, raspberries, blackberries or strawberries for scrumptious and gorgeous little tartlets. 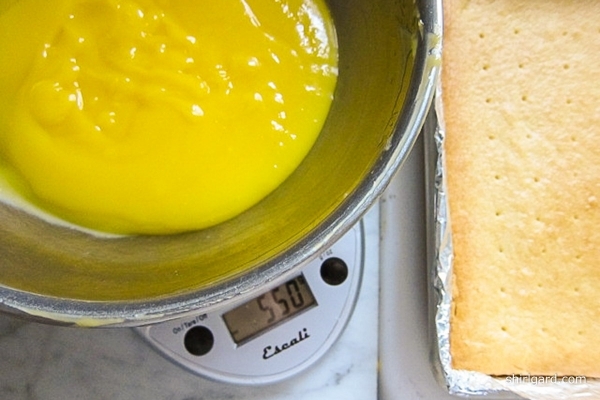 If you want to make a large tart, lighten the Lemon Curd with some whipped cream. Cookies—Lemon Curd Linzer Cookies: Either “Sandwich” Cookies or “Thumbprints” (Use almonds or hazelnuts for the Linzer dough). 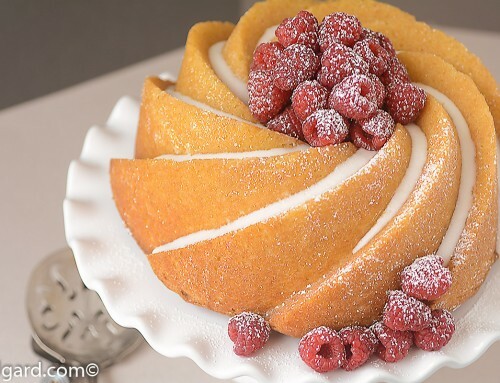 Roulade or Cake Roll Filling—Lemon Silk Filling: This is simply Lemon Curd with a little whipped cream folded in. 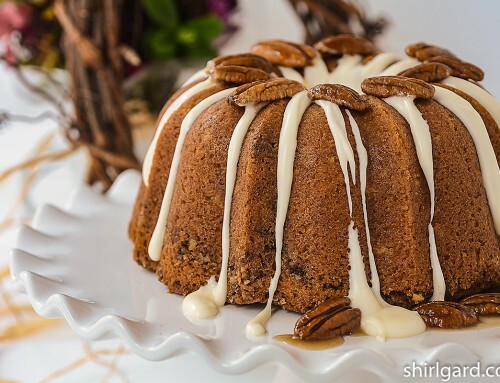 Dessert Sauce—Lemon Curd Sauce for desserts; it is especially good with gingerbread. Just thin the Lemon Curd with a little heavy cream or hot water (the cream will produce a paler yellow color; if you want to maintain the bright yellow, use hot water). Whipped Cream—Lemon Curd Whipped Cream: Add a little Lemon Curd for a lightly flavored lemon taste. Mix Dough in Kitchen Aid with paddle. Shaping foil over the back side of pan first makes it easier to fit inside. Quarter sheet pan lined with foil. Press dough into a 6″ x 8″ rectangle and place on a quarter sheet of parchment sprinkled with flour. Roll out dough to an even thickness the size of the parchment. 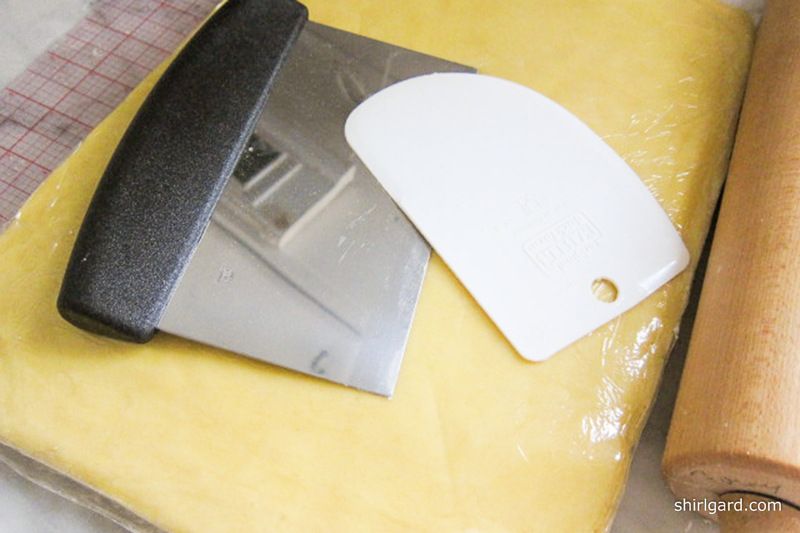 Shape edges using a bench scraper and bowl scraper. 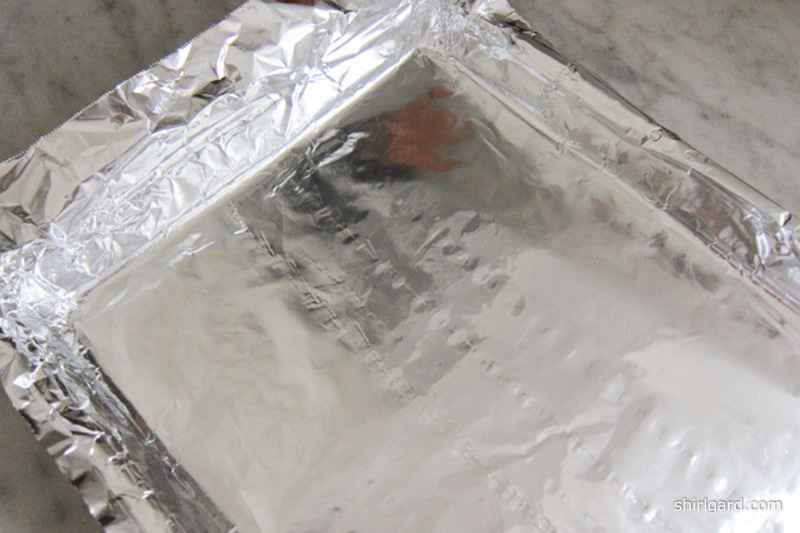 Lift dough (still on the parchment) into the foil-lined pan. Freeze. 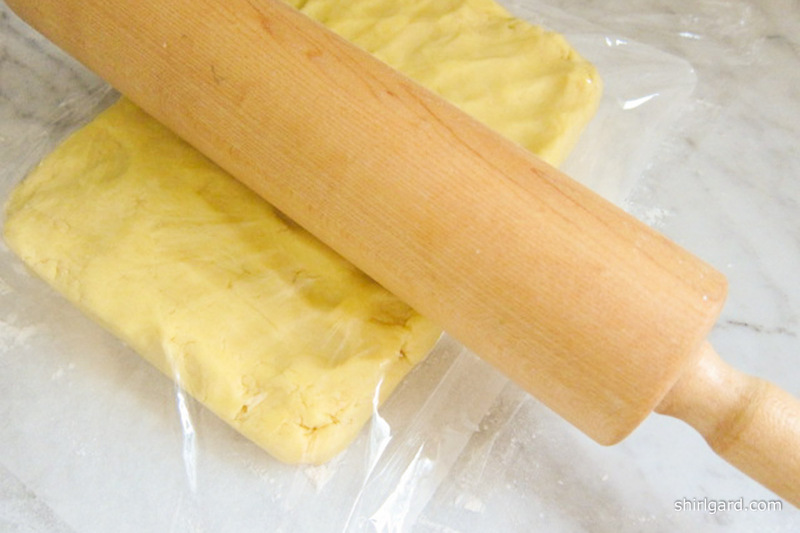 Dock frozen dough with a wooden skewer at 1″ intervals. 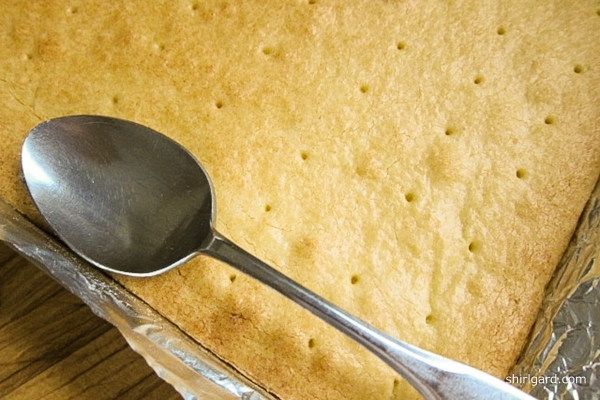 After baking, while still hot, press down the puffed edges with the back of a spoon for even thickness. 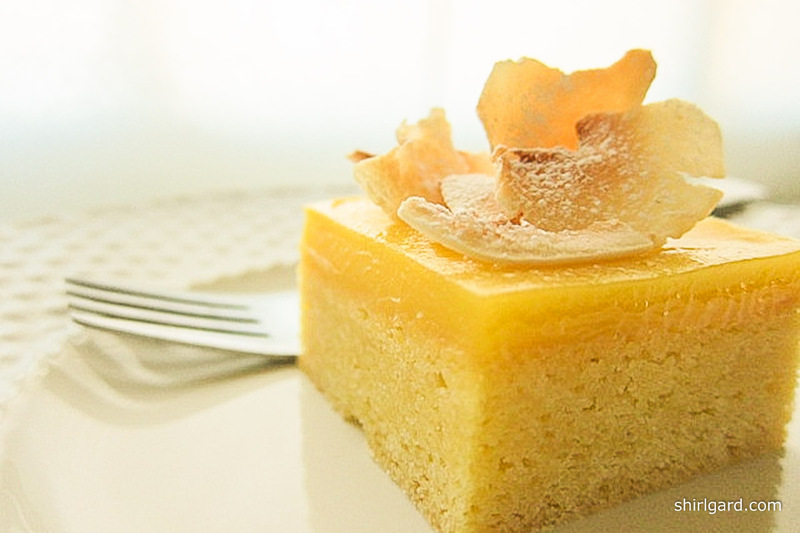 Scaled warm Lemon Curd & warm crust. Ready to spread and bake. Freezing the bars after baking and cooling allows you to lift the bars out of the pan. 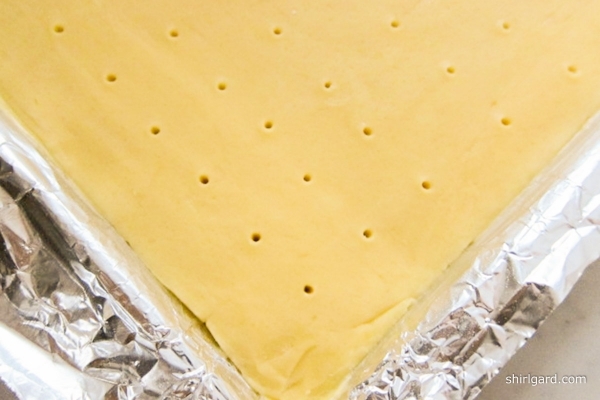 Peel the foil from the bars and discard; keep the parchment in place. On a cutting board, cut the bars in half lenthwise. Trim edges on the long sides making the two halves exactly 4 inches wide. Cut half of the bars in 1″ x 4″ long thin bars. Garnish witih toasted coconut flakes (chips). Plated and eady to eat. 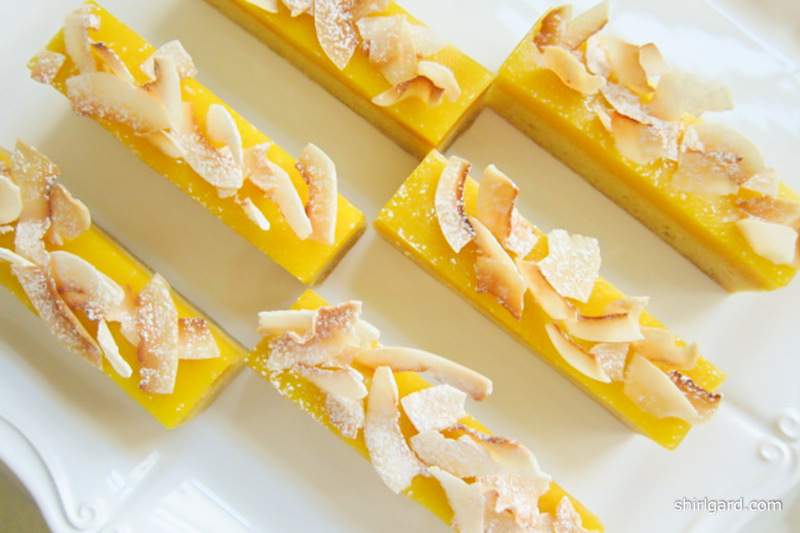 Lemon Curd & Sablé Breton Bars: 2″ squares with toasted coconut flakes (chips). FOR THE CRUST: Preheat oven to 350°F / 176°C - 30 minutes before baking.Prep quarter-sheet pan: Line pan with foil, building up the sides ½" all around. Spray with non-stick spray. 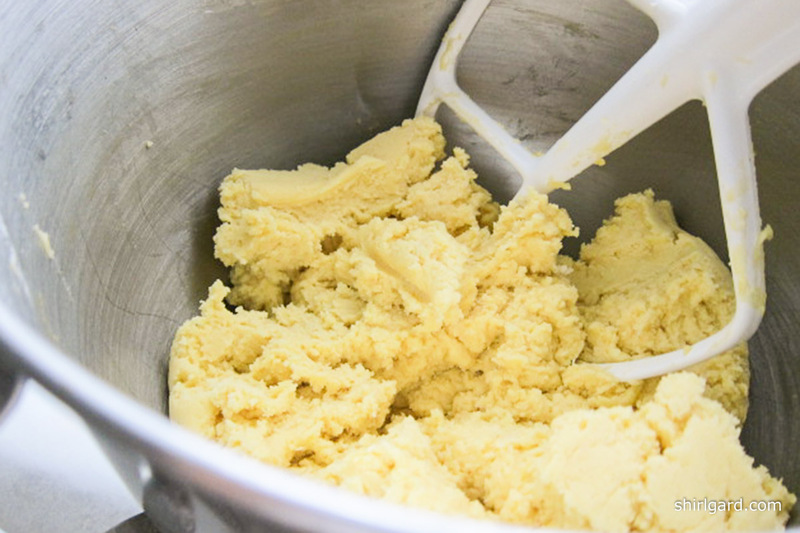 TO MIX THE DOUGH: Use Kitchen Aid mixer, first with whisk, then with paddle. In mixer with whisk, whip egg yolks about 2 minutes on medium speed. Turn speed to low, and slowly drizzle in sugar with mixer running, another 2 minutes. Scrape down bowl and change to paddle. Still on low speed, add soft butter, a chunk at a time with mixer running, 2 more minutes. Whisk together the flour, baking powder, and salt. Add to the bowl in four batches, pulsing in each addition on the lowest speed, mixing until just barely combined. Scrape up bottom of the bowl and mix in. Transfer dough to floured counter. 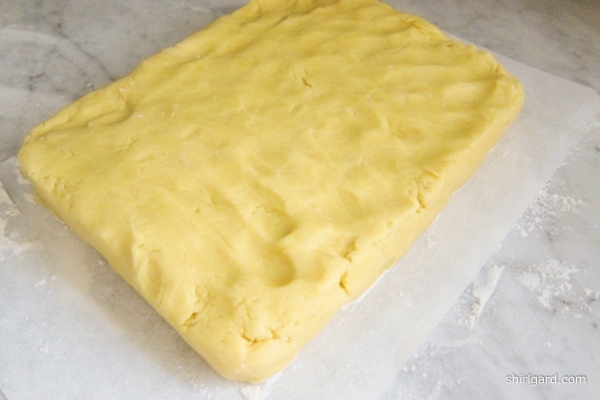 Press the dough together and pat into a 6" x 8" rectangle about 1 " thick. 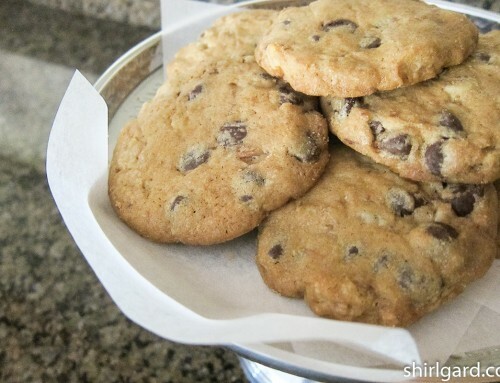 Lift onto a quarter-sheet of floured parchment paper. Cover with plastic wrap. 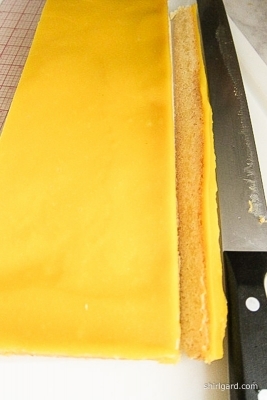 Roll out to an even thickness the size of the parchment. Patch corners with excess dough from the sides and ends. Lift into foil-lined pan, leaving the plastic wrap intact. Smooth the top with the flat side of a plastic bowl scraper. CHILL DOUGH: For 2 hours in refrigerator or 30 minutes in freezer. DOCK: Prick the dough through the plastic at 1" intervals, using a wooden skewer, then remove plastic wrap. (If dough is frozen hard, temper at room temperature about 20 minutes, then dock.) Bake partially frozen. BAKE @ 350°F / 176°C for 20-25 minutes, until a wooden skewer tests clean and the top is very lightly browned. 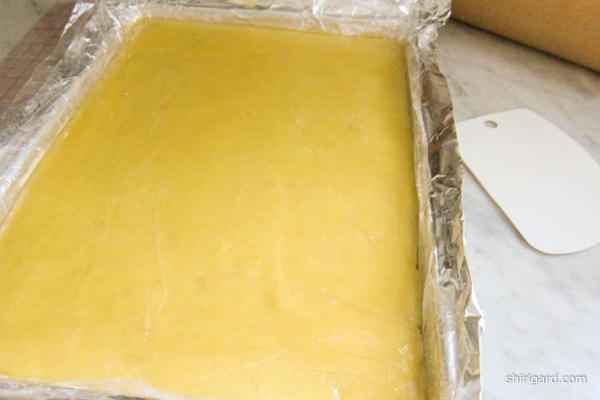 Let cool about 10 minutes before adding the Lemon Curd layer. The idea is to have warm crust and warm filling ready at the same time for baking. If making the crust ahead of time, re-heat before filling. 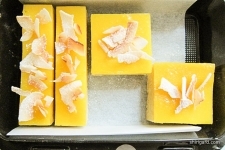 MAKE THE LEMON CURD FILLING: Peel the zest off the lemons in thin strips with a vegetable peeler, then coarse-chop the zest; it will be strained out of the curd later. Squeeze the lemons and strain the juice; weigh or measure the correct quantity of lemon juice. Caution: Make sure that no white pith gets into the curd mixture, either from peeling the zest, (cut any white pith off the backs of the peeled strips with a pairing knife if necessary), or from juicing the lemons (don't squeeze too close to the pith). Either of these things could cause the curd to be bitter. Whisk the yolks in a bowl until smooth. Temper half of the boiling liquid into the yolks, whisking constantly. Pour the yolk mixture back into the pot and insert a probe thermometer into the liquid. Stir constantly in a "figure-8" motion with a wooden spoon or heat-resistant rubber spatula (red handle), going often into the corners of the pot. Continue cooking slowly over medium-low heat until the curd thickens to a firm-set, about 10 minutes overall. During this time, turn the heat on and off as necessary, stirring constantly, to prevent the curd from coming to a boil and to maintain a temperature of about 178°F (81°C). If you don't have a thermometer, cook until you can run your finger through the curd on the back of the spoon and a mark remains; this is called the nappé stage. Remove from heat and Immediately strain through a strainer into a bowl. TO REPEAT: Cook to between 178° (81°C) and (no higher than) 180° F (82°C), the maximum temperature to keep the curd from coming to a boil. Must cook gently, stirring constantly in a "figure-8" motion. NEVER BOIL. NOTE: If you have previously made lemon curd on hand, cold from the refrigerator, scale out 550g (1¼#); then warm it gently in a bowl set over a pan of simmering water to a temperature of 140°F (60°C) before baking. Stir often. 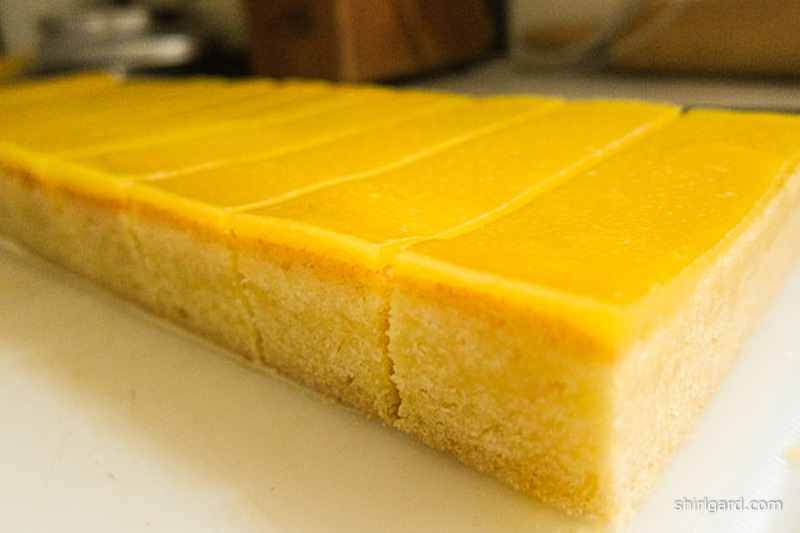 Spread warm Lemon Curd on warm crust and bake only 5 minutes just to set and smooth out the curd. Let cool completely in pan. Freeze overnight in pan unwrapped. 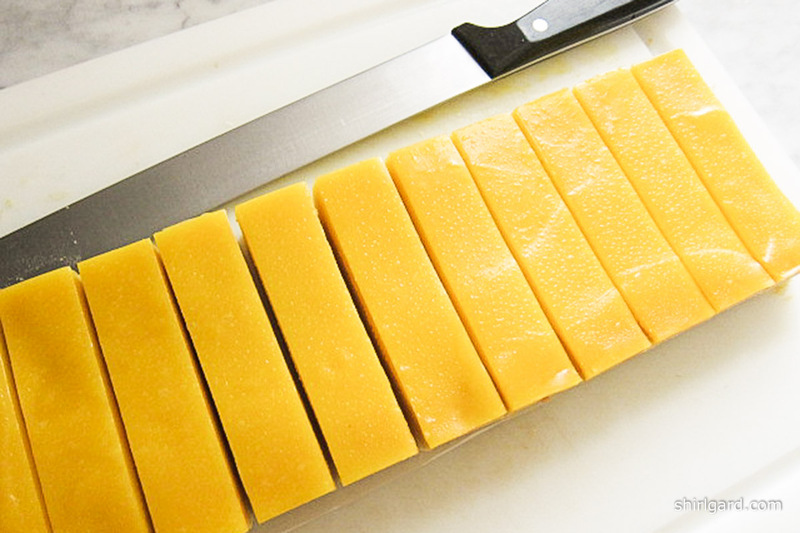 TO CUT BARS: Let the pan of frozen bars sit at room temperature for 30 minutes before cutting. 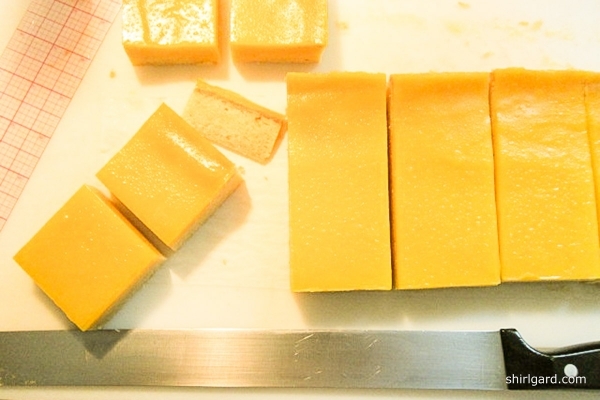 Cutting the bars while partially frozen will insure clean sharp edges. 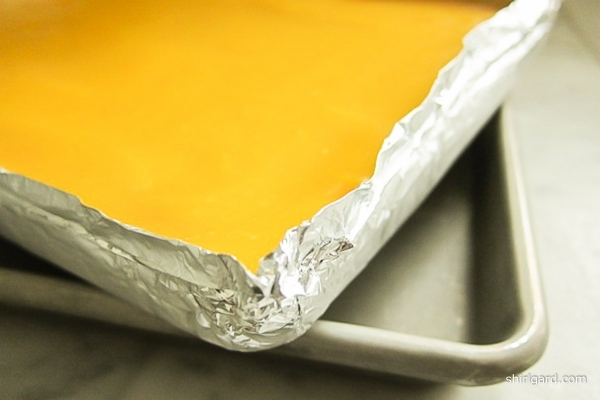 Holding on to the foil, lift the bars out of the pan and place on a cutting board. 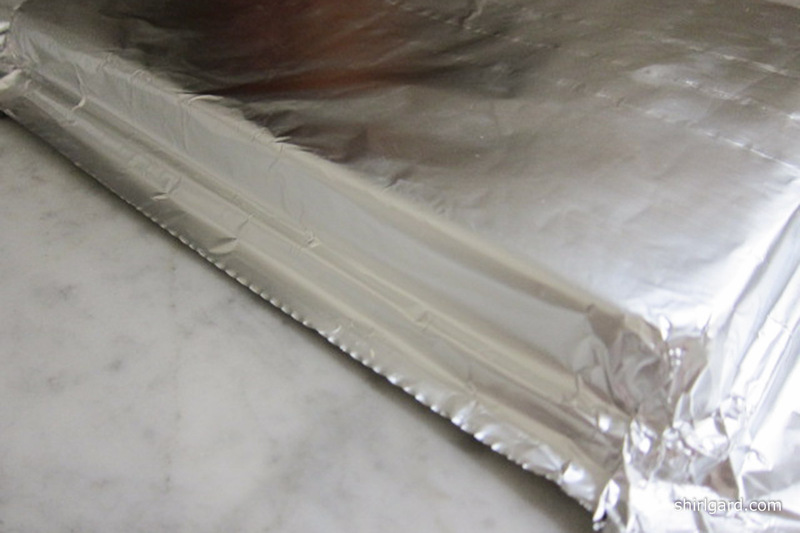 Peel off the foil and discard, but leave the parchment on the bottom; this will facilitate turning the bars on the cutting board when necessary. Use a long thin slicing knife and run under hot water (or dip in a pitcher of hot water) and wipe the knife with paper towels after each cut. Use a see-thru ruler for measuring. FOR 2" SQUARES: Cut crosswise in 2" strips . Cut the strips into 2" squares, starting at the cut end of each strip. Save scraps for snacks. FOR 1" X 4" LONG THIN BARS: First, cut in half lengthwise. Trim the un-cut side so that each strip is 4" wide. Cut the strips into 1" bars. Save scraps for snacks.